Calsonic Kansei Corporation (President & CEO: Hiroshi Moriya, Headquarters: Kita-ku, Saitama City) announced that it has concluded the Saitama Prefecture Forestation Agreement with Saitama Agriculture and Forestry Corporation, a public service corporation. Calsonic Kansei will engage in forestation to protect the environment in Saitama Prefecture where its headquarters are located. Forestation by Calsonic Kansei will start with the donation of funds for improving forests owned by Saitama Agriculture and Forestry Corporation within the prefecture. Calsonic Kansei will continue to support the initiative with the participation of its employees. Prior to the announcement, a signing ceremony for the "Saitama Prefecture Forestation Agreement" was held by the involved people at 10:40 AM on December 6 at the Saitama Prefectural Office. 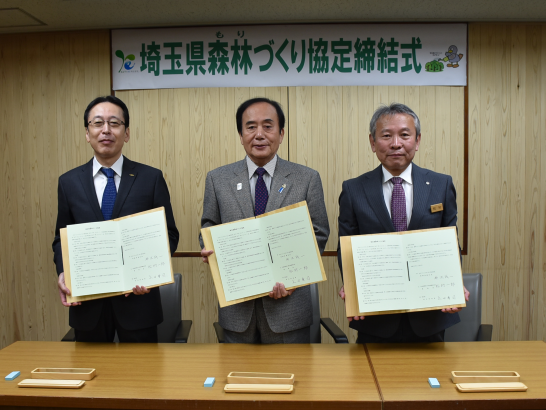 The agreement was concluded by the Governor of Saitama Prefecture, Kiyoshi Ueda; Administrative Director Ichiro Matsumura (forests' owner) from Saitama Agriculture and Forestry Corporation; and Executive Vice President Seiichi Kakizawa from Calsonic Kansei Corporation. The term of this agreement lasts from December 6, 2017 through March 31, 2023. Calsonic Kansei is aiming to contribute to environmental protection in Saitama Prefecture in the long term even after the agreement term finishes.